Physical computing is one of the most engaging classroom activities, and it’s at the heart of most projects we see in the community. 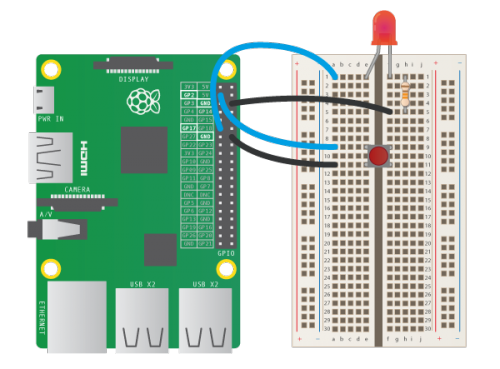 From flashing lights to IoT smart homes, the Pi’s GPIO pins make programming objects in the real world accessible to everybody. Some three years ago, Ben Croston created a Python library called RPi.GPIO, which he used as part of his beer brewing process. This allowed people to control GPIO pins from their Python programs, and became a hit both in education and in personal projects. We use it in many of our free learning resources. However, recently I’ve been thinking of ways to make this code seem more accessible. I created some simple and obvious interfaces for a few of the components I had lying around on my desk – namely the brilliant CamJam EduKits. I added interfaces for LED, Button and Buzzer, and started to look at some more interesting components – sensors, motors and even a few simple add-on boards. I got some great help from Dave Jones, author of the excellent picamera library, who added some really clever aspects to the library. I decided to call it GPIO Zero as it shares the same philosophy as PyGame Zero, which requires minimal boilerplate code to get started. As well as controlling individual components in obvious ways, you can also connect multiple components together. Normally, if you want to detect the button being pressed you have to think about the edge falling if it’s pulled up, or rising if it’s pulled down. With GPIO Zero, the edge is configured when you create the Button object, so things like when_pressed, when_released, wait_for_press, wait_for_release just work as expected. While understanding edges is important in electronics, I don’t think it should be essential for anyone who wants to create a simple interactive project. Also collections of components like LEDBoard (for any collection of LEDs), FishDish, Traffic HAT, generic traffic lights – and there are plenty more to come. Other wacky ways to set the brightness of an LED: from a Google spreadsheet – or according to the number of instances of the word “pies” on the BBC News homepage! Alex Eames gave it a test drive and made a video of a security light project using a relay – coded in just 16 lines of code. Remember – since the release of Raspbian Jessie, you no longer need to run GPIO programs with sudo – so you can just run these programs directly from IDLE or the Python shell. GPIO Zero supports both Python 2 and Python 3. Python 3 is recommended! Let me know your suggestions for additional components and interfaces in the comments below – and use the hashtag #gpiozero to share your project code and photos! A huge thanks goes to Ben Croston, whose excellent RPi.GPIO library sits at the foundation of everything in GPIO Zero, and to Dave Jones whose contributions have made this new library quite special. 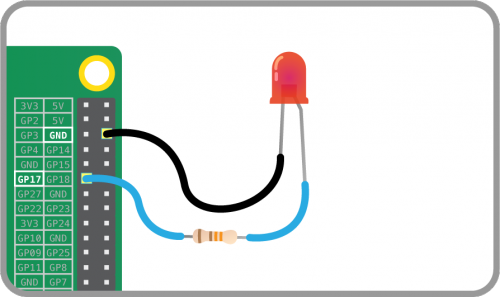 See the GPIO Zero documentation and recipes and check out the Getting Started with GPIO Zero resource – more coming soon. in the first code example? Thanks – fixed. I threw the wiring diagrams in last. This is excellent, one less reason for the pi user to need sudo. Next challenge is re-writing Gordon’s WiringPi to use the same techniques so that WiringPi programs don’t need to run with sudo to access GPIO pins. Thanks, Andrew. I’ve got wiringPi V2.29 but hadn’t seen there was some set-up needed to use /dev/gpiomem. do? Do they bind an action for when the button is pressed/released later on? Or do they turn the led on/off then that line of code is running? Yes, they bind a function to the action of the button being pressed and released, i.e. when the button is pressed, turn the LED on. We also provide generic classes for InputDevice, OutputDevice, PWMOutputDevice and more. One less barrier to interfacing to the real world with the Raspberry Pi! I have been running Jessie for a while. I have done sudo apt-get update and upgrade but I am getting an ImportError No module named gpiozero. I have encountered issues in the past where I have initially installed sw using pip and I have later installed through apt-get. So I prefer the later. Do I just need to be patient and wait for it to be installable using sudo apt-get install gpizero or will everyone need to use pip? I am running into exactly the same issue James. I am running the Raspbian Jessie image but cannot import the gpiozero library into Python. Also if I attempt the apt-get install commands I get package not found. Did you ever resolve your issue? Thanks Ben; all working now! Thanks for all the good work Ben. I’m new to Linux and Python. I’ve followed your install instructions to the letter (I think), but every time I hit the “sudo apt-get install python3-gpiozero python-gpiozero” command, I get the “E: Unable to locate package python3-gpiozero” error. This has been going on for several days. Any idea whats the issue? I don’t want to update this pi to Jessie, as I it’s configured for a specific job and I don’t want to start it from scratch with a fresh install, and I got the impression that updating from Wheezy to Jessie was a bit flaky. Any ideas how to install gpiozero in this set up? Thanks for including the ADC, please include LCD and IO expander chips. That would give a big punch to the whole project. Working on it, but IO expanders in particular is going to take a while. I’ve now got a very good idea in my head of exactly how the guts of the library need to change to support IO expanders (and how to maintain backward compatibility for all existing use cases); just need to find the time to implement it (and all the other myriad things on the todo list like a proper test suite!). Can’t promise anything on the LCD side – I don’t think we’ve got any specific tickets regarding those yet, but if you’ve got something in mind do go open a ticket on the repo (https://github.com/RPi-Distro/python-gpiozero) and we’ll certainly consider it! That’s a rather different beast to the MCP3004/8 but we are intending to support port expanders at some point (see my reply above). If you’d like support for this one in particular, do feel free to open a ticket on the GitHub repo so we don’t forget anything! Otherwise, going in a good direction. Is there a Basic available for Pi? I am old school (very old!) I will search when I get a chance. I’d guess that GPIO Zero will gain support for more ADC chips over time. The problem with using a more generic name like “AnalogInterface” is that it could apply to an awful lot of chips with slightly different interfaces which we need to account for in the implementation. As Ben mentioned earlier in the comments, we do have generic classes and in this case MCP3008 derives from AnalogInputDevice which is an abstract class representing an SPI connected ADC (we should probably rename the base class to indicate that it’s SPI specific but anyway…). The fact remains, in this case being specific is necessary as the class is only intended to talk to an SPI connected, 8-channel, 10-bit ADC (i.e. an MCP3008). Does this mean that ultimately we’ll wind up with lots of ever so slightly different classes for a variety of ADCs? Sure, but then that’s a very good use-case for class inheritance. I love BASIC too. If you don’t mind getting to grips with a different operating system then try flashing a spare card with RISCOS, which comes with classic BBC BASIC integrated. I can’t say whether either of these have been (or need to be) updated specifically to work with the Zero, though – no doubt someone will jump in and let us know. Sorry, but hiding the control flow seems like a bad idea. What’s the point of “led.red.source = red_pot.values” without understanding loops and conditional statements so one can move on beyond the simple “wiring in software” to match the hardware wiring? It might need a few less lines to have a button control an LED than its predecessor, but those lines weren’t hard to learn and taught something useful. GPIO Zero’s source is advanced Python too, e.g. metaclasses, so that’s more of an impediment to one’s exploration. Features like led.blink() and source/values provide a shorthand for common uses, and allow the user to do more than they could without. I’d start with a while loop turning the LED on and off, and that’s fine for many people, but once you get to the point you want to do two things at once, you’re stuck in a while loop. What if you want to flash an LED and update an LCD display at the same time? We provide a simple solution to allow multitasking without letting timing slip. How do you create a python module? Could you create a raspberry pi controlled BMO using gpiozero? Could do! It’s been done with a Pi before but I’d love to see a GPIO Zero one! Cool. I love adventure time. My favourite character is BMO. Apologies if this is a very noobie issue! – Can I integrate a NOIR camera module here? And yes, the Pi NoIR works the same. I use windows for my Python scripting, so how would I install this on a windows system? I am fairly new to all of this, so please bare with me. I am using your module to switch a relay on and off, basically by using the “LED” method. What strikes me as funny, is the fact that when I set the led to “ON”, it switches the relay off….and vice versa. Any particular reason why it would do that? Your relay is connected between the output pin and 3.3v when it should be connected between output and Gnd (or vice versa). Alternatively, you are using the normally closed output terminals on your relay, rather that the normally open pair. It’s so brilliant. I have been trying to program two interrupts with two different buttons, but the bounce_time parameter is not accepted in float. What would be my error? These look very similar, but they are doing unrelated things. Reduced to beginner concepts, the first one fetches and assigns on value, while the second “causes led to keep getting its values from pot until told otherwise”. Under the surface, it’s even more complex, with a thread updating led from pot. My concern is that beginners might start out having fun, but not have much success in forming an internal model, such that they fairly soon “hit a wall” where the next level of understanding requires advanced Python skills. (Perhaps after the instructor has moved on, so they don’t hear about it). But that’s just a guess. How well is this system working for teaching beginners, in your experience? PS: The first problem – different things looking alike – might be easy enough to solve, if your design wasn’t frozen. You can’t change the syntax, but you could have a naming convention which distinguishes the second usage (led.source = pot.values). (not the best choice, just the first example off the top of my head) The call_for_value means that it should be assigned something which provides a series of values, which .provides_values would do. and wonder why it doesn’t work. With the button, pressed means the pin is low, because it switches to ground. That is a bit counter-intuitive because pressed, or “on”, would normally mean high. Just like led.on() means high, and not low. for digital signals that are not buttons. I came across the button bounce_time bug mentioned above, so I updated to the latest version (1.2.0), and it still doesn’t work properly, albeit without the error message. Then when you press the button, the buzzer just goes on sounding forever. If you then change ‘buzzer.on’ to ‘lambda: print(“button pressed”)’, it only works once, and seems to get stuck. I can’t use the Button without a bounce_time, because then the callback usually gets called multiple times. Has development on this stopped. I am looking forward to seeing 16×2 LCD being integrated into this , but I see that further development has stopped. Kids! Teachers! Developers! PyConUK was a blast!